Foodies love nothing more than trying new restaurants and especially when it involves meeting other Bloggers, who share their food passions. So when Cha Cha Moon invited me to try out their new menu, I was excited to see what they had created. 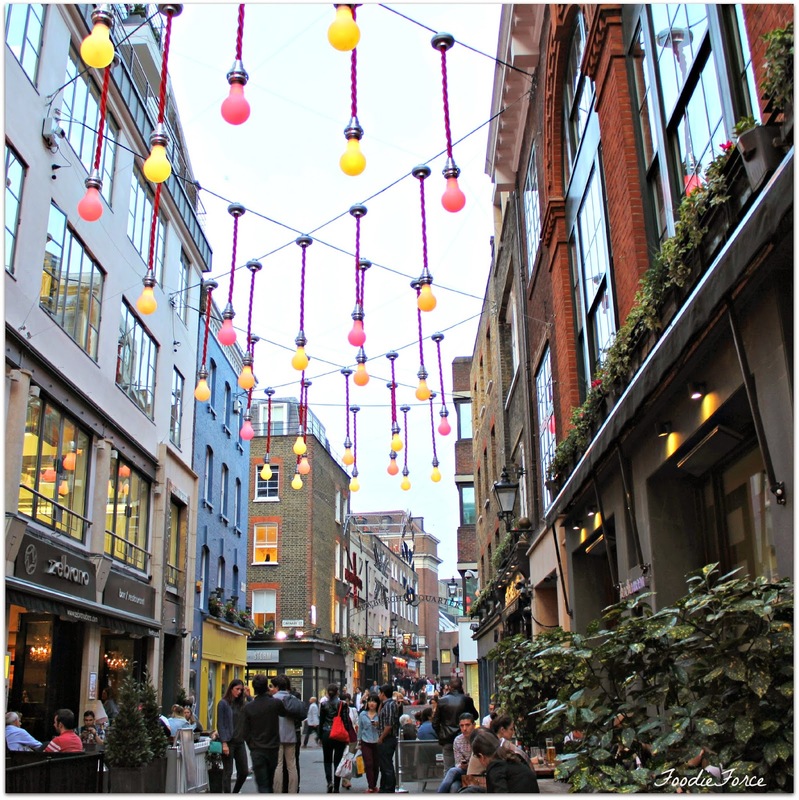 Based just off of Carnaby Street in Ganton Street London, Cha Cha Moon is hidden behind two giant red wooden doors. 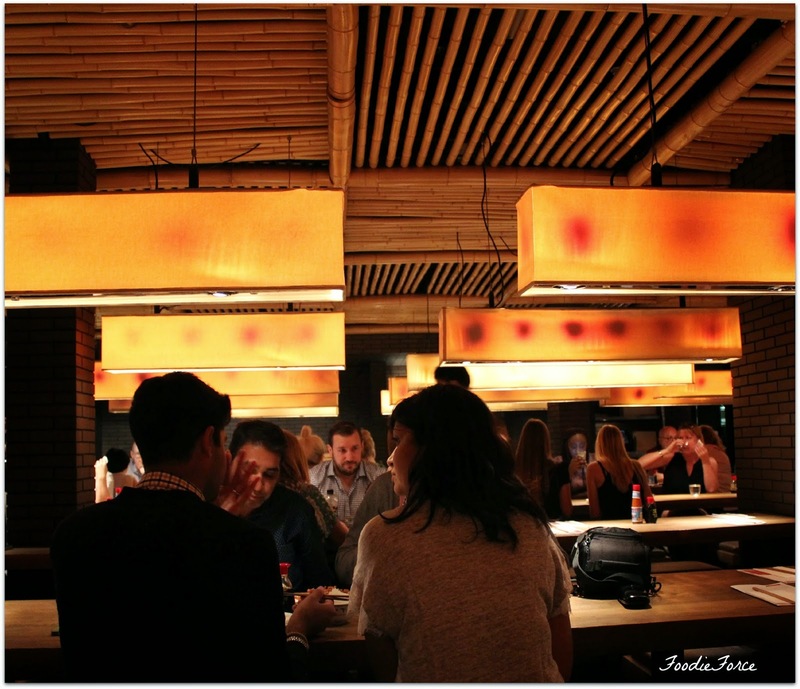 The restaurant is authentic in design with bamboo ceiling, wooden benches and mood lighting. We were greeted by the lovely Sebastian who briefly explains some of the history of Cha Cha Moon. Originally developed by renowned restaurateur Alan Yau, the creator of Wagamama and Hakkasan, Cha Cha Moon offers authentic Chinese cuisine. Now some of you may well remember how much I love Hakkasan, having visited their restaurants in Abu Dhabi and Las Vegas. If you haven't read the post you can have a look here. Based on this visit I had high expectations for Cha Cha Moon. Having just run from work and being rather hot and bothered, I start with a cold non-alcoholic cocktail, "Guava Collins"(£4.50), made with Guava, coconut and Lime. It was wonderfully refreshing. The restaurant as part of their new menu, have introduced fourteen new dishes as well as three new juices to their South East Asian menu. Looking at the menu we are all in for a treat. We kick the tasting off with Thai Crunch Salad(£8.50). 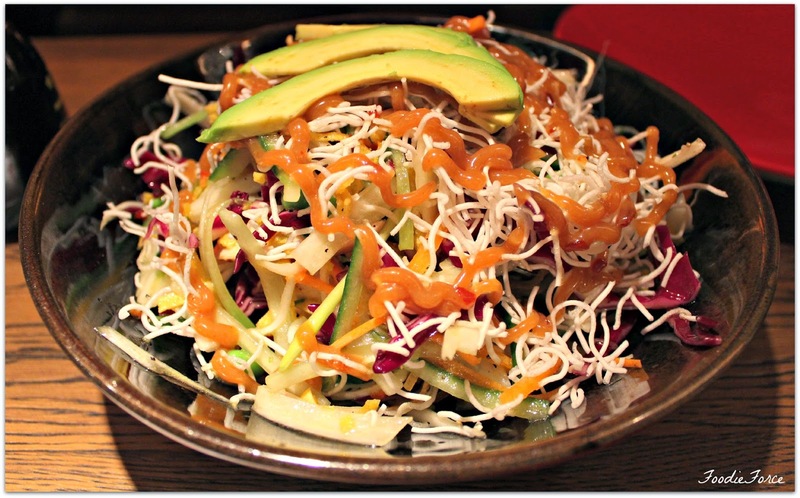 The salad has the perfect combination of crispy rice sticks and spice. The crunchy vegetables with the Thai lime and peanut dressing are so good. The addition of chicken makes this a mighty salad. 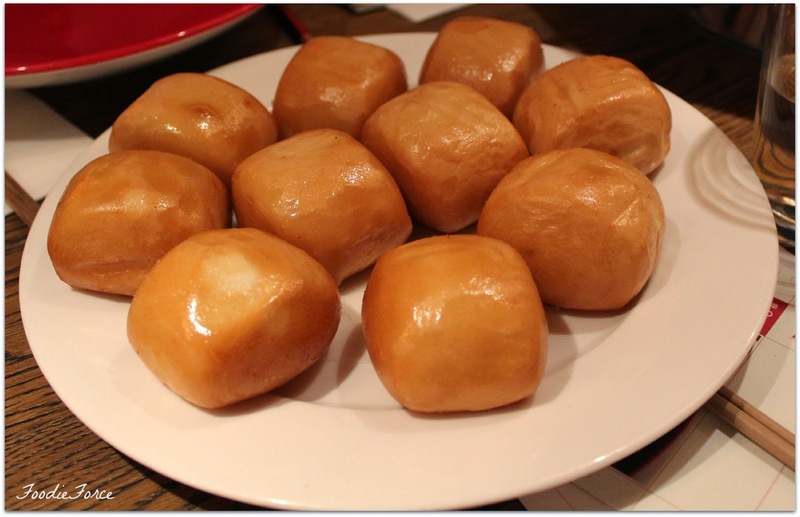 It would be a perfect accompaniment to share with other dishes. I am not sure I would eat this as a main though. Next up is the Malaysian Chicken Satay (£7.25). 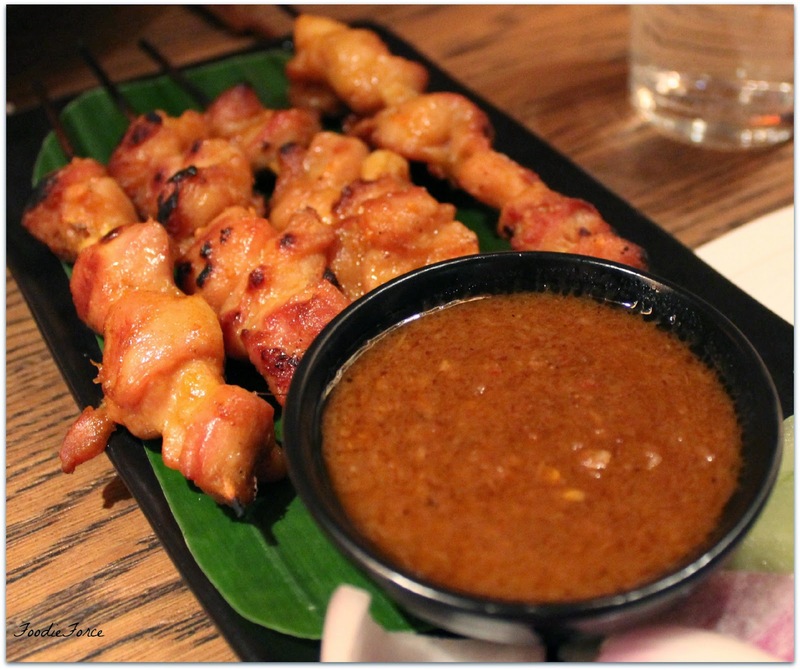 Charcoal smoked chicken skewers served with authentic Malaysian satay sauce. The chicken on its own is delicious but mixed with the made in house sauce a smoky and wonderfully spicy peanut taste. This is the perfect starter to share or greedily eat all by yourself. In between courses we have a little pit stop break in which we busily talk about food. It is lovely to sit with other food bloggers who love their food and sharing their foodie passions as much as I do. All this talking is making me thirsty the next cocktail I opt for a Wen Wen (£6.50). Mixed with peach, raspberry and Vodka this was a highlight of all the drinks. It combines two fruits I love and is wonderfully sweet and refreshing. Next up on the menu is Malaysian Laksa (£8.50). For those of you who crave the comfort of a steaming bowl of noodle soup, this dish will most certainly hit the spot. A popular spicy noodle soup from Peranakan culture. Perfect as the weather closes in and London gets colder. The Laksa for me was by far the highlight of the evening. The broth was so creamy with the coconut milk and just the right balance of lemongrass and chilli curry paste. Perfect. Next up Kung Pao Chicken. Kung Pao chicken is a favourite of mine, I love the mix of sweet and sour flavours. This dish however did not match up, I have definitely had better. It could be that this dish followed the Laksa which had such strong seasoning that it knocked the flavours of this dish off. 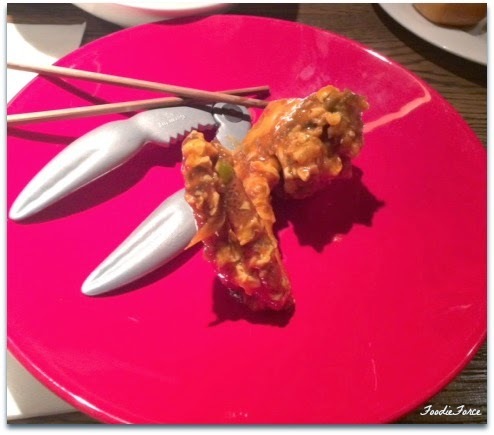 Next up was something that I had been looking forward to all night, Singapore Chilli Crab (£25) served with steamed buns. Served in a huge wok, the whole large mud crab takes centre stage. The sweet shallot, fiery ginger and sweet chilli sauce was divine. There is something immensely satisfying using crab crackers and devouring the meat inside. The sauce was perfect for dipping the sweet steamed buns in. This meal is perfect for sharing and was so delicious and satisfying. At this point I am absolutely full, the highlights of the new menu definitely for me has to be the Laksa and Singapore Chilli Crab. Desserts consisted of Mango Pudding and Dadar Gulung. The sweet grated coconut in the pancakes was a hit for me. 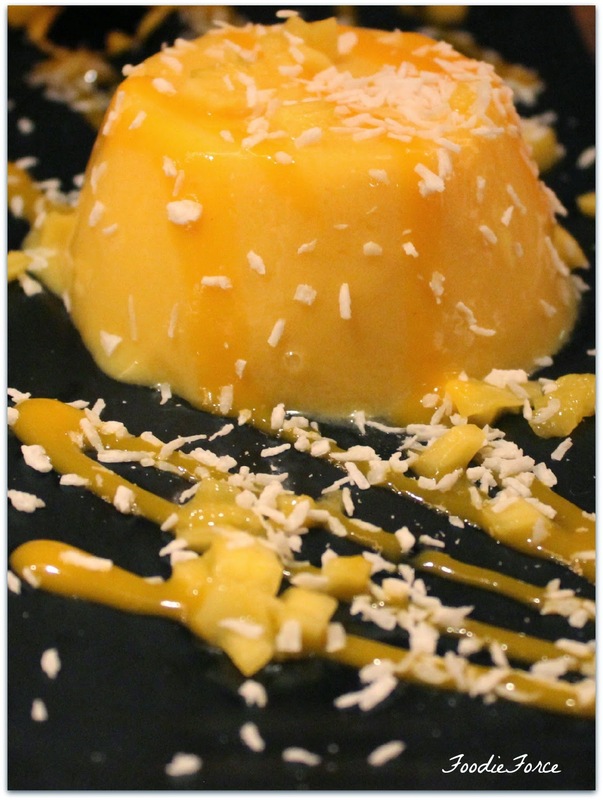 I am not a great fan of mango but someone who likes this would love the mango pudding which had a similar consistency to panna cotta. I had a wonderful meal and Cha Cha Moon is definitely now firmly on my restaurant list. 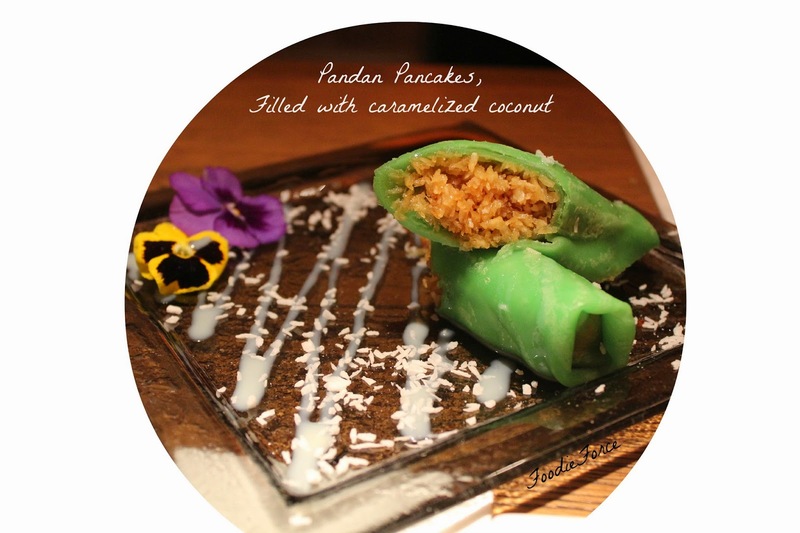 If you are looking for an authentic South East Asian restaurant with a modern twist then this has to be it. Head chef, Le Kim Choong has worked his wonder here and with portion sizes slightly bigger than you would expect, definitely go hungry. I was kindly a guest of Cha Cha Moon, however, this in no way affected my review of the restaurant which had wonderful South East Asian food. Wow! All this food looks stunning, Lucy! I would love to try that crab. 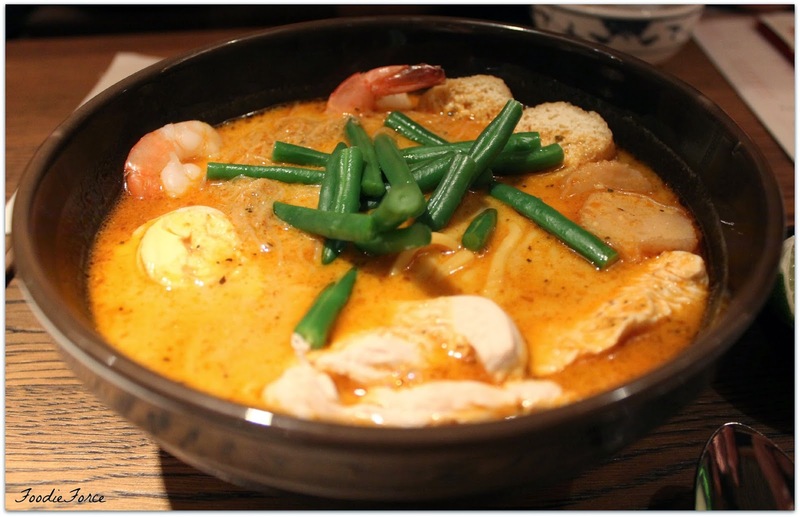 I love Laksa any time of year, and I would have greedily eaten the chicken satay all by myself!!! Oh, I must come visit you sometime!!!! That Wen Wen cocktail looks delicious! I would love that non-alcoholic cocktail with guava. I am crazy about guava and mango. The mango dessert would be something I want to try. Coconut isn't my favorite thing to eat, especially shredded. However, I can do it if it is done right. You had such a great meal there, everything looks so yummy. mmm from photos looks so yummy :) I would want to try the crab!! !